Honors Choir is a festival held in the fall each year, divided into a men's and a women's choir. They have separate guest conductors and share a concert, combining for 2 pieces at the end directed by each conductor. During the festival, singers also participate in a mock audition similar to what happens to get into District Chorus, and directors provide written feedback and score sheets for each singer. This year's festival will take place on October 26-27, 2018 at Baldwin High School. Singers in grades 9-12 are eligible to participate. Those interested should get an application from Mr. Cloonan at the beginning of the school year and return it ASAP so that forms can be submitted early. PMEA Senior High District Chorus 2018-19 will be held February 6-8, 2019 at Mt. Lebanon High School. Grades 10-12 are eligible to audition. Monday, November 19 at 4pm at Belle Vernon Area High School. Transportation to and from the audition and the festival sites will be provided. Registration fee for the audition is $5. 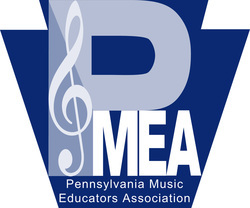 Students must bring cash or a check made payable to "PMEA District 1" to the audition registration table. The audition process has changed for this year. There are now 2 audition pieces (one lyrical and one technical) and a very short (4 measure) sight-singing example (no more difficult than anything done in class). Click below for PDF copies of Antiphon by Randall Thompson and I Love My Love by Gustav Holst. Original copies will be provided for those planning to audition. Here are YouTube recordings for reference while practicing. Individual part files will (hopefully) be coming soon. Rehearsal Files: "I Love My Love"
Those who successfully audition at District Chorus for the region festival will sing at Greater Latrobe March 20-22, 2019. At the Region festival, auditions are held to advance to All-State Chorus. The All-State festival happens in conjunction with the PMEA State Conference. This year, it takes place in Pittsburgh on April 3-7, 2019.